I’ve collected some of the best, worst, and strangest names the English Puritans came up with. Most of these are courtesy of the 1888 book by Charles Bardsley, Curiosities of Puritan Nomenclature (seen here on the Public Domain Review’s website), which includes Parish records with details about some of the people who had these names. To show that some of these names are still in use, I’ve referred to 2012 statistics on names in the UK from the Guardian’s interactive chart of baby names. If-Christ-had-not-died-for-thee-thou-hadst-been-damned. Praise-God’s son, he made a name for himself as an economist. But, for some inexplicable reason, he decided to go by the name Nicolas Barbon. Fear-not. His/her surname was “Helly”, born 1589. Tace. It’s another word for silence, and is of course a female name. Kill-sin Pimple probably wouldn’t have agreed. But, to be fair, his first name was only half of his problem. 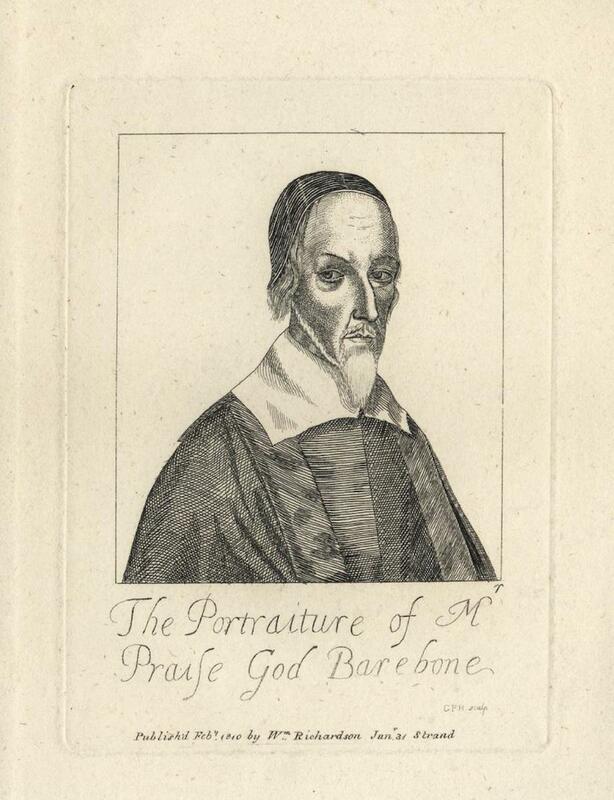 “The Portraiture of M Praise God Barebone,” published Feb. 1840 by Wm. Richardson. Image via Kentucky Digital Library.